Yet another four door coupe SUV is coming to market endowed with horsepower to keep us happy. Once again our spy photographers’ trip to Sweden for car spotting during the winter testing season has paid off because they have just managed to capture images of another vehicle enduring the cold to ensure that customers in snowy regions aren’t left with a dysfunctional vehicle. Unlike the Audi A8 and M Sport BMW 6 Series GT we saw earlier, the Land Rover Range Rover Sport Coupe has a more pressing need to ensure that it can tackle the white stuff. Aside from the fact that it's a Land Rover, this rings especially true since we’ve heard news that Porsche would push its hugely successful Cayenne and Macan into the coupe-ified SUV segment. As we’ve recently been finding out, the word “coupe” has lost much of its meaning. No longer does it signify a two-door vehicle for those without the need to fit children and friends inside. Instead, the term now means any car with a sloping roofline. While Land Rover can be praised for starting the luxury SUV segment, automakers like Mercedes and BMW can be credited with the bold push into the SUV coupe segment and JLR has no choice but to follow if it wants to keep up. Adapt or die, amirite Darwin? The camouflage encumbers our view of the sloping rear roof but it’s the rear windows that give away the coupe look. While we can expect the front end of the Range Rover Sport Coupe to look a bit different than its brother with the bulbous rear, the interior should look nearly identical. 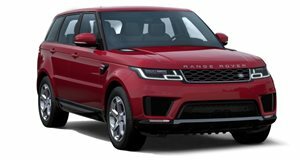 In order to appeal to the far and wide corners of the segment, Land Rover will likely keep the list of engine options vast. Expect to see JLR’s range of Ingenium engines available starting with the 2.0-liter four banger and stretching to our favorite, the supercharged 5.0-liter V8 reserved for SVR trims. Diesel options should also be made available for those with trailers to haul while plug-in hybrids could ensure the polar bears don’t attack the Rover when off roading in the snow.